It always feels good to be back. Godzilla had fared better than the apartment in terms of infestations – just the usual squirrel poop we’ve come to expect, since the place is wide open. What I like best about returning, apart from seeing the house and getting all pumped up about it again, is the welcome we get from the community. We aren’t there as much as we used to be and we’re obviously peripheral to the tight-knit local group, but everyone notices when we return, even for a couple of days, and greets us. There aren’t very many people in our little hamlet and a lot of them seem to be related. The family who runs the local bar and restaurant (Albergo Picetti)) is a good example. The father sold us part of our land. One of the sisters is married to our contractor. The other sister is our neighbor, whose husband helped us get rid of the junk in the Clean Team episode. They just moved in Monday to a new house that took them six years to build. We used to joke that it was a race to see who got their house ready first, but their six years now looks miraculously fast compared to us. Seeing that they’d actually moved in, we stopped by to admire their new digs, their new baby, and have a coffee. Our apartment overlooks the bar, so when we hang out our windows we can shout greetings back and forth to the people coming in and out, in typically noisy Italian fashion. That’s how people know you’re there, when you stand around in your window. I’m not always completely certain who they all are, but they know us as the Canadians who have inexplicably developed a fondness for their remote corner of the world. Even the old men who have been playing cards at the bar for decades mutter their recognition, sometimes smile, and make a space for us to have our beer. I love this sense of familiarity and community, however peripheral we may be. 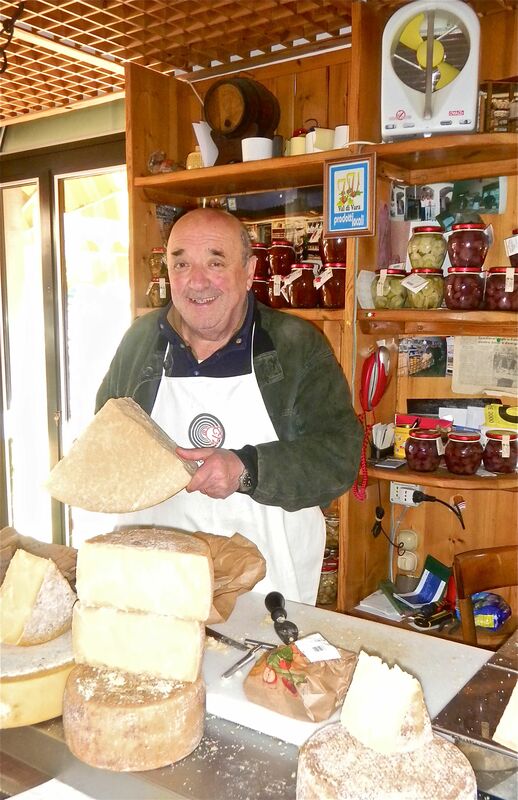 The cheese man at the grocery store greets us with the informal ciao now, a sign of acceptance in the formality of Italian society. He shook my hand when we were leaving and asked when we’d be coming back; he knows we always do. It is this sense of community that keeps us coming back.